Graded washes create areas of paint that move gradually from dark to light, or from one color to another. In today's painting, I applied an underpainting of permanent yellow with a touch of alizarin crimson. After that had dried, I painted the blocks in graded washes of either yellow or alizarin, and after that had dried, I painted graded washes of prussian blue, going in a different direction. In some places, the new color pooled or bled into already painted areas that were still damp. I didn't really mind - that saved me from having a painting that would have looked like 16 industrial paint chips from the hardware store! 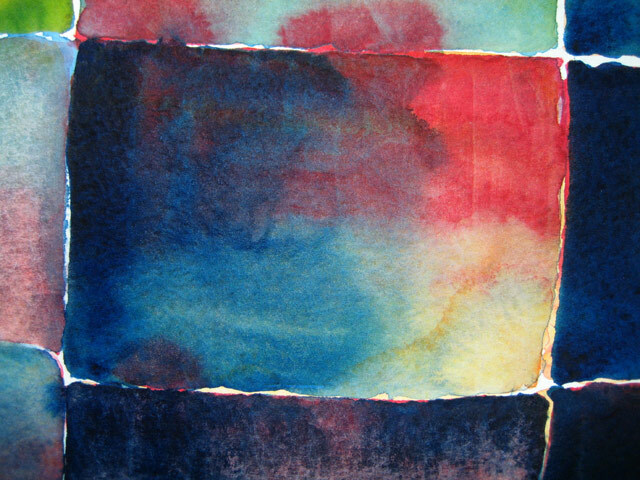 Graded washes are among the hardest techniques to carry off well in watercolor, and they are also among the most useful techniques to know how to do. I will have the chance to do more of them during this Art Every Day for the Month of November challenge. 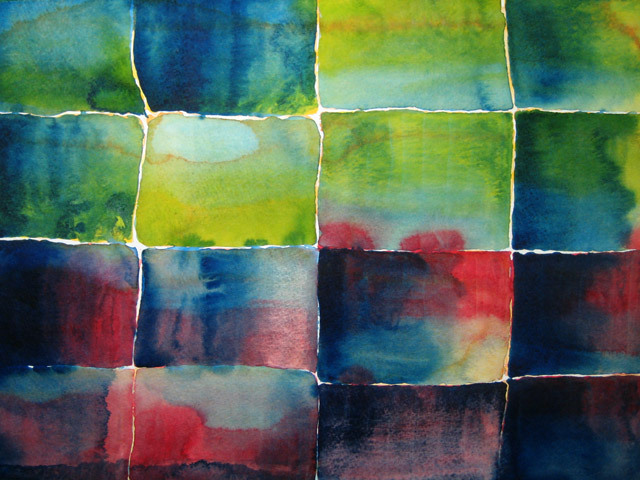 Thank you for your encouraging comments on these watercolor experiments that I am making. I wasn't sure if it was useful to describe how I was doing... now I'm glad that I am it is helpful. And mosaic is a good way to describe this image! Gorgeous - simply gorgeous. Love to see what happened with the color after reading along with your process. Reminds me of tracking moments in a day. Tracking moments while I'm painting... I like that idea as a way of understanding what's happening with the washes and the brushstrokes! Thanks!